A rapidly aging U.S. population with complex care needs will likely accelerate emphasis on palliative care services. A review of palliative care research found substantial evidence to support clinical practice guidelines and was incorporated into the new edition of the guidelines. Black and Hispanic patients are more likely to receive care from poorer-quality hospices. And their family caregivers are less likely to receive the right amount of emotional and religious support in hospice care. However, caregivers of black and Hispanic patients report similar or better experiences than caregivers of white patients within a given hospice. This article describes the current status of home-based medical care in the United States and offers a brief narrative of a fictional homebound patient and the health events and fragmented care she faces. Understanding how patients experience care can encourage delivery of high-quality services. It also helps payers, including the Centers for Medicare & Medicaid Services, ensure that they pay for effective and efficient care. Estimation of six-month prognosis is essential in hospice referral decisions, but accurate, evidence-based tools to assist in this task are lacking. This study assessed hospice use by men dying of prostate cancer and compared the use of high-intensity care between those who did or did not enroll in hospice. Those who enroll in hospice are less likely to receive high-intensity end-of-life care. Discussing hospice with a health care provider could increase awareness of hospice and possibly result in earlier use. 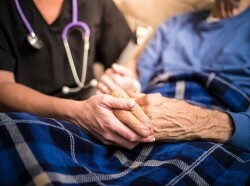 The purpose of this article is to examine variation in resource utilization across and within patient stays in the context of Medicare's per diem payment system for hospice. Hospice care has been found to improve symptom management, quality of death and quality of life at the end of life. Expansion of home/community end of life services can reduce acute care costs and benefit patients by accommodating expressed preferences on place of death. 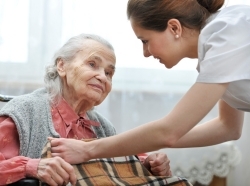 Evaluates factors that affect the financial performance of hospice. Vulnerable elders receive on average only half of recommended care; for conditions that affect primarily the elderly, they receive appropriate care less than one-third of the time. 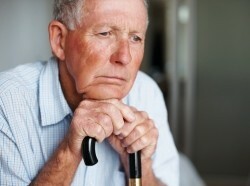 Interventions based on ACOVE indicators can improve the care physicians provide to older adults. More focus on these satisfaction elements might improve the effectiveness of end-of-life interventions and their evaluation. Uses a literature search to identify quality measures for palliative cancer care and the evidence to support their use in pain, dyspnea, depression, and advance care planning, and to ascertain research gaps. The authors summarize the relevant parts of each Democratic presidential candidates platform, along with President Bushs stance.